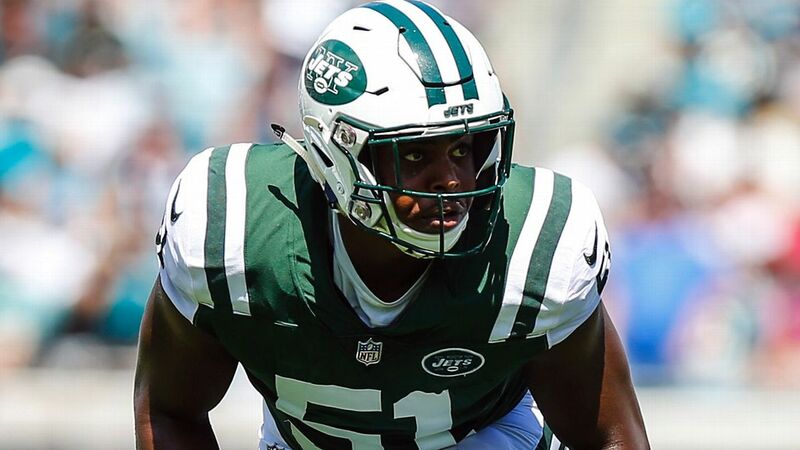 With a gaping hole in their defense, the New York Jets have re-signed starting outside linebacker Brandon Copeland, the team announced Monday. Terms of the contract weren't immediately available. He drew interest from his previous team, the Detroit Lions. Copeland, 27, was a pleasant surprise last season, as he recorded a career-high five sacks in his first year with the team. He started out in a minor role, but he wound up starting 10 games and participating in 55 percent of the defensive snaps. He also was a key contributor on special teams. The Jets had an opening at outside linebacker in their 3-4 defense because free agent Anthony Barr reneged on an agreement at the start of free agency. He opted to re-sign with the Minnesota Vikings. Copeland's return won't preclude the Jets from addressing the position in the draft. With the third overall pick, they could be in position to pick Kentucky linebacker Josh Allen. Copeland, an undrafted free agent out of Penn in 2013, bounced around before playing three seasons with the Lions (2015-17). He signed a one-year, $1.4 million contract last offseason with the Jets. This offseason, he's working as a co-professor at Penn, where he teaches a financial literacy class. The Jets also re-signed backup tight end Neal Sterling, who made six catches for 47 yards last season. He was limited to six games because of a concussion.